Democrats took a shellacking during President Barack Obama's first midterm election in 2010, and U.S. Rep. Solomon Ortiz's loss was one of the biggest surprises. Eight years later, some are wondering if Republicans have some overly confident incumbents unprepared for a potential "blue wave" in November. In early October 2010, Washington political analyst David Wasserman began to sense the political winds were turning toward Republicans in such a big way that he posed an absurd question to Democrats across town: Was U.S. Rep. Solomon Ortiz in trouble? Ortiz, a Democrat, represented Texas' 27th Congressional District and had easily coasted to re-election for decades. His Republican opponent was a brash radio host named Blake Farenthold making his first run for office. But Wasserman, armed with a GOP internal poll showing Ortiz down by eight points, felt compelled to ask a perplexed Democratic Congressional Campaign Committee staffer if there may be an actual race unfolding down in Corpus Christi. “He’s fine,” the operative wrote of Ortiz. In a month’s time, his 28-year grip on the seat would wash away in one of the biggest political waves in U.S. House history. With Farenthold’s recent resignation from Congress amid a sexual harassment scandal, the race that propelled him to Congress eight years ago might seem like useless political trivia. But what happened in this seat, a once-safe Democratic district that stretched from Corpus Christi along the gulf coast to the Mexican border, defines what a truly massive political wave can accomplish. Democrats need to pick up 23 seats to recapture control of the U.S. House next year. But many political insiders are projecting a much bigger landslide is in the making, akin to what Republicans saw in 2010. If such a scenario takes place, Democrats will have likely managed to take out the 2018 Republican equivalents of Solomon Ortiz – members who had no idea they were in a political dogfight until it was too late. Democrats interviewed for this story will quickly note in hindsight that they always knew the 2010 cycle would be bad – they just had no idea how dreadful of a year it would be. “Once health care happened, we knew the world was rumbling and we weren’t sure what the rumbles meant or where they were,” said C.R. Wooters, a Democratic strategist at the time who was tasked with protecting House Democratic incumbents. Midterms are nearly always bad for the president’s party, but in 2010 that trend was amplified after President Obama signed his health care overhaul into law in March — sending the GOP base, newly organized through the burgeoning Tea Party movement, into a seething rage. Like any other election year, he and his colleagues were bracing for 30 or 40 of his party’s incumbents to face tough races. The party had previously won seats deep in Republican territory in two successive waves, in 2006 and 2008. Insiders joked that they were only “renting" those seats as the districts were Republican in their DNA and would eventually move back to their natural column. In Texas, the two Democratic incumbents the party was worried about early on were U.S. Reps. Chet Edwards of Waco and Ciro Rodriguez of San Antonio. Incumbents like them were pressured as soon as they were sworn in to start fundraising in preparation for their next election. Ortiz was in a completely different category. He had easily held on to his seat since first being elected in 1982. In 2008, the district's voters sent him back with 58 percent support. Yet Republicans in the district had not given up on it entirely. 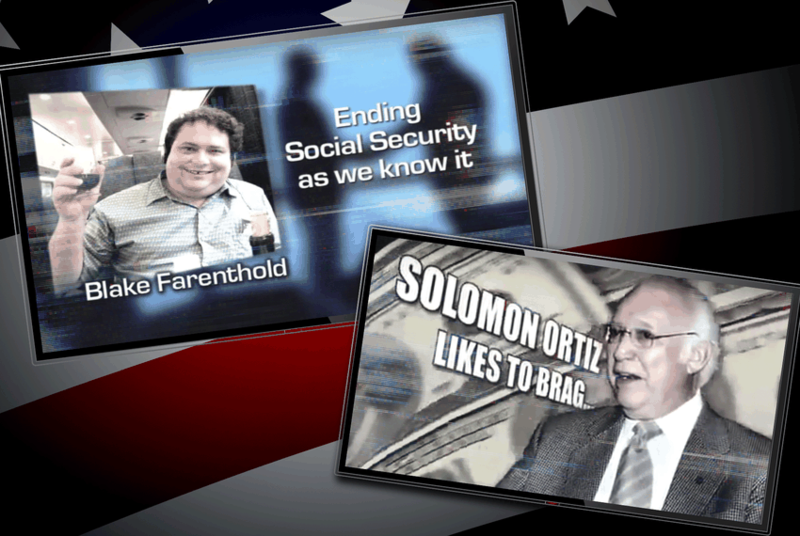 Though Farenthold did not even enter the race until early 2010, just weeks before the primary, he joined a crowded field full of underfunded candidates. He and his team ran a competent campaign. Farenthold came in a close second on primary night and then won the GOP nomination outright in a runoff. But while candidates in races viewed as more competitive were methodically padding their war chests to prepare for the fall, Farenthold spent nearly everything he raised each quarter, allowing Democrats to believe he was not a threat. At the same time, Ortiz's fundraising lagged, regularly failing to clear $100,000 in a quarter and one quarter coming in at around $43,000. Compare that to Edwards, who knew all along he had a tough race ahead of him and never raised less than $280,000 a quarter. And Farenthold had some unique strengths: He was a local radio personality, he had the means to self-fund his race to a degree and he had a prominent surname as the step-grandson of former state legislator Sissy Farenthold. And most of all, the political environment was deteriorating by the day for Democrats. By the fall, two native Texans – Guy Harrison, executive director of the National Republican Congressional Committee, the House GOP campaign arm, and U.S. Rep. Pete Sessions of Dallas, the committee's chairman – sensed that their first tier of targeted races were moving in their favor and began looking for districts to expand their effort. For a while, they had heard “grumblings” of local dissatisfaction with Ortiz. Out of curiosity, Harrison polled the district around early October and recalled being in “utter disbelief” with the results showing Ortiz was in trouble. So much so that he ordered a second poll. The results didn't change. National Republicans began to target the district — albeit quietly, to avoid showing their hand. This was about the time Wasserman, an analyst with The Cook Political Report, began to ask the Democrats if they were concerned about the state of things in South Texas. His curiosity was based in demographics, but after poking around a bit, he obtained the poll showing Ortiz in trouble. "Word on the street in Corpus Christi is that Farenthold has an 8 point lead in the district," longtime political reporter Paul Burka wrote. Two days later, Ortiz donated $95,000 of his personal money to his campaign and soon began airing television advertisements. In a week’s time, the incumbent who once skated to re-election had to scramble to pull together a modern campaign. The same scenario was happening elsewhere in the country, as the Republican riptide suddenly appeared poised to pull under powerful Democratic House members in places like Missouri and South Carolina. But there was something else that neither Ortiz nor national Democrats anticipated that would make the scramble that much harder: the newly-invented super PAC. Early in 2010, the Supreme Court made a ruling in the Citizens United v. FEC case that allowed for the creation of political entities that can collect and spend unlimited sums in federal campaigns. Republican strategists quickly created an infrastructure of such groups. Democrats lagged far behind, and the party's candidates bore the brunt of Republican attack ads that fall. While Farenthold didn't have gangbusters fundraising in his own right, Republican outside groups spent about $160,000 in a cheap South Texas media market to attack Ortiz. But there was one last factor that Ortiz's camp and the DCCC assumed would be their last bit of re-election insurance: Farenthold’s pajamas. Democratic operatives far and wide pushed a photo of Farenthold posing in duck-print pajamas at a charity event next to a scantily-clad young woman. Local and national media outlets ran with it. Surely, the Democrats thought, voters would think twice about a candidate who had appeared in such a photo. “There didn't seem to be any sort of drop in the engagement of his potential supporters and voters,” an Ortiz staffer told the Tribune. And that's the point of the wave metaphor. No matter how how weak or strong of a swimmer the contenders are, a powerful enough national sentiment against a party can develop such that even a longtime incumbent can lose control of a race. The margin on election night was so close that the race went into a recount. But in the end, Farenthold carried the seat by 775 votes. For those who had been closely watching the political map nationally, the outcome was among the most unexpected of the year. The Republican-controlled state government redrew the state's congressional lines the following year, including a dramatic reframing of Farenthold's 27th District. Instead of a district that stretched from Farenthold’s base of Corpus Christi down into the Democratic Rio Grande Valley, the district now swung deep into Republican inland counties and reached up to Austin. Farenthold went on to coast to re-election every two years, even as sexual harassment allegations against his office began to build in late 2014. But eventually, the situation became politically untenable amid the #MeToo movement last fall. In December, Politico reported that Farenthold had settled a lawsuit from a former staffer with $84,000 in taxpayer money. Faced with a related ethics investigation, he announced his retirement weeks later and then officially resigned from Congress earlier this month. It appears unlikely he will pay that money back. While he was one of Congress' few experts on software policy, Farenthold never quite shook the duck pajamas image from that first campaign and conceded in his retirement announcement that his political inexperience set the stage for future trouble in his office. "I'd never served in public office before," Farenthold said in December. "I had no idea how to run a congressional office and, as a result, I allowed a workplace culture to take root in my office that was too permissive and decidedly unprofessional. It accommodated destructive gossip, off-hand comments, off-color jokes and behavior that in general was less than professional." Democratic activists are downright giddy on social media about the party’s prospects in the fall. The wave emoji has become a common means of conveying the all-but-assumed sweep coming in the fall. Even among more cold-blooded operatives, the types who have lived through blue waves and red ones, there is indisputable optimism. Harrison, the GOP operative, remains dubious that a Democratic wave is coming. He argues that U.S. House Minority Leader Nancy Pelosi’s unpopularity mitigates the struggles President Trump faces in polling. But he does concede that the influx of Democratic candidates all over the country, even in seemingly safe Republican seats, is unnerving. “In normal elections, what happens is you don't even have candidates there,” he said. To exacerbate the problem, Democratic candidates are raising piles of money, even in Texas, where Republicans hold 24 of the state's 36 U.S. House seats. National Democrats are targeting three Republicans representing districts that Democratic presidential candidate Hillary Clinton won in 2016 – John Culberson of Houston, Will Hurd of Helotes and Sessions. Hurd in particular has been a top target for Democrats in the past, as his House district is viewed as the only true swing district in the state. That's also why Hurd started preparing for this year's race soon after he won re-election in 2016. But that's prompted speculation that other, more complacent Republicans representing districts that would be viewed as rock-solid red in normal election years — the GOP's own Solomon Ortizes — may now be potential Democratic pick-ups. Such thinking has boosted the Democratic bids of the likes of M.J. Hegar, who is in a runoff to take on U.S. Rep. John Carter, R-Round Rock. Donald Trump won Carter's district by more than 12 points in 2016. Yet Hegar managed to outraise Carter this past quarter. And so, seven months out from Election Day, Republicans in Washington remain worried, Democrats are optimistic, and Wasserman, the analyst, is displaying a curiosity reminiscent of 2010.